From the EMyth perspective, you became a highly skilled Technician – doing what you love with care and focus – day in and day out, year after year. And then you decide to make a change. You want to expand your reach, of course, by building a business that does what you do, reaching more markets, and securing your legacy. That’s the Myth in EMyth: It’s what Michael E. Gerber called the myth of the Entrepreneur; that someone who is an expert at doing a thing is naturally an expert at running, building, and growing a business that does that thing. Most new businesses will fail in their first five years, largely because their founder/technician is unable to make the transition to owner/leader. At EMyth we know that when we can help a technician/owner shift his or her thinking, repurpose that passion they feel for their expertise and give them the tools and processes to inject and instill that passion into an organization with a mission to expand that product or service to the larger marketplace, they’re blazing the path to creating a business that works – a business that fulfills the dreams of not only the owner, but every single person that business touches. In survey after survey, it’s consistently confirmed that having a written business plan correlates with increased success in every one of the business goals studied, including sustained growth, securing a loan or investment capital and increased employee buy-in. In the absence of a plan, nothing useful happens. It is a fundamental tool for a leader! It's one thing to have that business plan that you can literally take to the bank – that aspirational plan for operational targets and goals – how many sales you want to make or how many widgets you want to sell. That plan, while critical and essential, is too easily filed and forgotten without an underlying plan that directly addresses developing your business. You need a plan that brings immediacy to your business development work. To truly be working on your business, you need to effectively move forward from intention to action. You need a plan that identifies and addresses the current and pending strategic growth opportunities in your business. You can direct your people to engage in the right actions now for maximum impact. Your annual plan makes the difference between thinking and acting strategically, being focused and proactive vs being reactive and random – struggling to respond to whatever fresh crisis confronts you every morning. Your annual plan gives you a constant reference point for your most important short and long-term achievable goals. When your managers and your employees understand the plan, share in your goals, and appreciate their personal stake and accountabilities in achieving them, you have an organization working in concert with the common objective of achieving those goals in an inspired and organized manner. 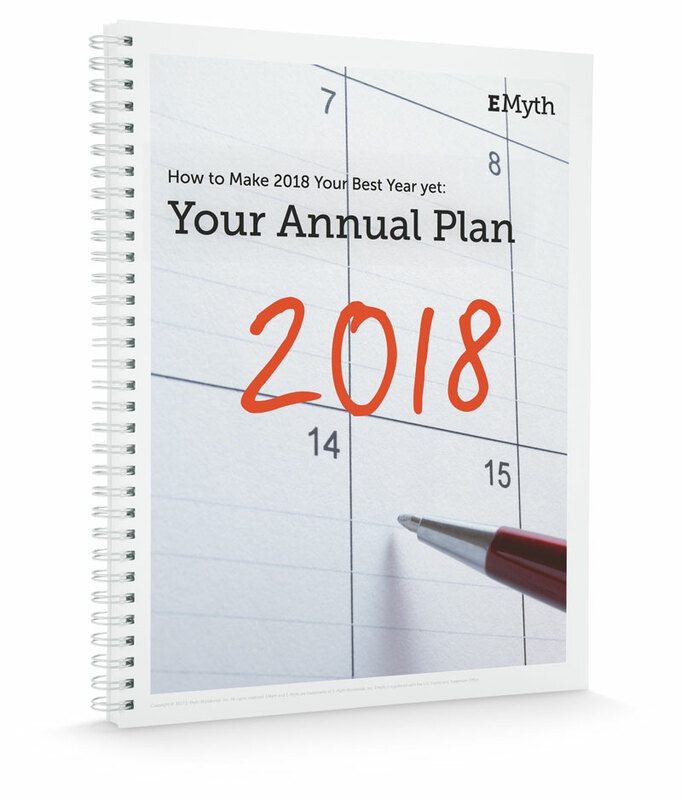 EMyth has created Your Annual Plan 2018. Its a 6-step annual planning guide that starts with your vision, assesses your current system strengths and challenges, and then provides you with the tools you need to identify and prioritize specific, actionable steps you can take through the next 12 months to convert your vision into tangible, game-changing results. Don’t put this off. It’s a gift from EMyth to you that can set you on the path to getting the life you want for yourself, your family, and all those who are touched by what your vision brings to the world.